Did Nationals pitcher Max Scherzer strike out Phillies batter Odubel Herrera on an illegal quick pitch Friday night in Washington? 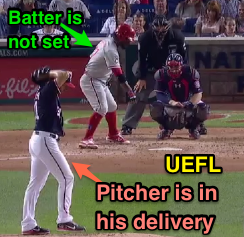 At first glance, video evidence suggests that Scherzer may have benefitted from HP Umpire Jeff Kellogg's failure to enforce baseball's quick pitch rule, but what does the rule really say? And did Herrera himself violate the batter's box rule? Did Kellogg miss Scherzer's quick pitch? The Play: With one out and none on in the top of the 5th inning of Friday's Phillies-Nationals game, Nats pitcher Scherzer delivered a 1-2 fastball to Phillies batter Odubel Herrera for a called third strike. Replays indicate Herrera did not appear to be looking at Scherzer as Scherzer pitched from Windup Position. The Rule: The variety of illegal pitch known as the "quick pitch" appears in two parts of the Official Baseball Rules. The first (OBR 5.07(a)) pertains to legal pitching deliveries and positions. 5.07(a) carries no real weight, however, unless backed up by an actual rule that penalizes illegal pitches. That's where Rule 6.02(a)(5) Comment factors in: "A quick pitch is an illegal pitch. Umpires will judge a quick pitch as one delivered before the batter is reasonably set in the batter’s box. With runners on base the penalty is a balk; with no runners on base, it is a ball. The quick pitch is dangerous and should not be permitted." There it is. Lest you think Rule 6.02(a)(5) only applies to balks (6.02(a) is the "it is a balk when" rule), the rule's comment clarifies that there is indeed a penalty for a quick pitch with no runners on: it's a ball. To reiterate, "The quick pitch is dangerous and should not be permitted." A penalty exists whether or not there are runners. Rule 6.02(b) also states that an illegal pitch thrown with the bases empty shall result in a ball added to the count, unless the batter reaches base. 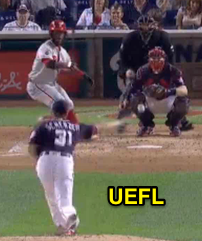 Analysis: Given the rulebook's strong language toward a quick pitch's danger, why then did HP Umpire Kellogg not call Scherzer for a quick pitch? Is there more to the story than meets the eye? Batter Herrera jumps out of the box. Reviewing the at-bat, we see that Scherzer is working briskly, "setting the tempo," so to speak. That's pretty good news for fans of baseball's popular "pace-of-play" issue. Herrera, on the other hand, isn't readying himself in the box in a particularly hurried fashion—at least not timely enough for the faster-paced Scherzer. In the second video below, notice Herrera's consistency in his leisurely act of getting set. Pitch-to-pitch, Herrera's cadence is fairly similar. Scherzer, on the other hand, acquiesces to Herrera's "slowness" on Pitch #2 of the at-bat, decides to press Herrera and pitches immediately upon Herrera coming set in the batter's box on Pitch #3, and, finally, delivers Pitch #4 before Herrera has come reasonably set in the batter's box, which results in the baseball arriving at home plate a mere fraction of a second after a visibly startled Herrera jumps backward and out of the left-handed batter's box. Scherzer's 1-2 delivery to Herrera appears to constitute an illegal quick pitch and, as Rule 6.02(a)(5) Comment states, "is dangerous and should not be permitted." This play should have been called back. The strike three call was incorrect as the ball should have been dead on the illegal pitch thrown to a batter who wasn't reasonably set, play resuming with a 2-2 count. Related Post: Rules Review - About Cleveland's Quick Pitch in Seattle (6/9/16). Related Post: MLB Ejection 016 - Ramon De Jesus (John Gibbons) (7/23/17). What About the Batter's Box Rule? : Though Official Baseball Rule 5.04(b)(4) states, "The batter shall keep at least one foot in the batter’s box throughout the batter’s time at bat," with exceptions allowed for a swing, check swing, "Time" call, pickoff play, fake bunt, wild pitch/passed ball, pitcher delay, or catcher leaving the catcher's box, the penalty for batter's violation is "the umpire shall issue a warning to the batter for the batter’s first violation of this Rule in a game. For a batter’s second or subsequent violations of this Rule in a game, the League President may issue an appropriate discipline." Note that in Minor League Baseball only, a second violation will result in an automatic strike called with no pitch having been thrown. The ball is automatically dead upon the enforcement of this penalty. Meanwhile, Rule 5.04(b)(3) states, "If the batter refuses to take his position in the batter’s box during his time at bat, the umpire shall call a strike on the batter. The ball is dead and no runners may advance." To bring everything full circle, notice that Herrera's preparation ritual takes place with his left foot within the batter's box (if not with both feet in the box). Thus, he is legal. However, even if Herrera was not legal pursuant to batter's box Rule 5.04(b)(4), a quick pitch is still illegal. Similarly, even if an umpire feels a batter is taking too long, the remedy is a Rule 5.04(b)(3) automatic strike—not allowing the pitcher to pitch when the batter isn't looking (something about being "dangerous"). Two wrongs don't make a right, and if a batter is not in compliance with 5.04(b), the umpire shall impose a warning or penalty before a pitch is thrown. As the rule states, "the ball is dead."